Sony STR-DN860 review | What Hi-Fi? The Sony STR-DN860 might seem like an underdog now Dolby Atmos-toting rivals have arrived. It was this omission from Sony that, during our recent first look at this superb-sounding five-star amp, had us speculating whether it would change the course of its fate up against new rivals. But though the surround technology has certainly proved a desirable asset for the Pioneer VSX-930 and Onkyo TX-NR545, and would surely be welcomed on the Sony, we don’t think it’s a make-or-break feature this far down the price range. Not when the STRDN860 well and truly stakes its claim on unmatched performance. While things may look very familiar on the outside, the inside has seen some tweaks in an attempt to improve on last year’s performance. For a start there’s an upgraded power supply to minimise noise and a new pre-amp chip that sees the input level, volume control and pre-amplifier stages individually grounded to minimise interference and stabilise the amplification process. Surface-level changes include the dual antenna on the back panel, which offer support for both Bluetooth and wi-fi (2.4GHz and 5GHz) simultaneously, while high-resolution music playback is much more inclusive now, compared with that of the DN850. DSD 5.6MHz (2ch) and FLAC 24-bit/192kHz (5ch) files get USB and network support, while DSD 2.8MHz (5ch) and WAV 24-bit/192kHz (7ch) files get the full house – playable via USB, HDMI and over your home network. As with last year, the STR-DN860 is a 7.1-channel amp, offering 95W per channel (into 6ohms, 2ch driven) with five HDMI ins and one HDMI out. Two of the inputs are optimised for audio, for getting the best from CD or Blu-ray players for example, while another offers 4K upscaling and passthrough with HDCP 2.2, meaning it will upscale all the way up to 4K/60fps. The single HDMI out packs HDCP 2.2 too. Legacy connections are covered by four sets of inputs for analogue audio and two for composite video plus one composite out, while digital inputs are made up of one coaxial and two optical ins. There’s a single USB input on the front panel as well as a headphone output. Getting the amp set up is as easy as ever, with Sony’s graphical user interface clear and easy to understand. The built-in wi-fi picks up our network with no issue and, once the included mic is connected, the speaker test tones take no more than a few seconds. We’d always recommend checking your measurements look correct at this stage before moving on. We found Sony’s results to be pretty accurate, and within a few minutes, we’re up and running. We put on The Amazing Spider-Man 2, and skip to the Times Square showdown between Spiderman and Electro. The STR-DN860 wastes no time jumping straight into the action. It’s a hugely authoritative sound, with plenty of controlled rumble in the low end, balanced out with a superb level of clarity throughout the midrange and treble. This makes for a wonderfully engaging presentation – one that pumps excitement into any action scene, but that also has a softer touch for taking on the quieter scenes too. Voices are direct and full of nuance, cutting through even the busiest of scenes. Every strand of audio in complex montages takes its place without being lost or forgotten in the mix. We compare it to our 2014 Product of the Year Award winner, last year’s DN1050, and find the DN860 tops it for transparency. There’s also more subtle detail up for grabs. While not quite as spacious in its soundfield as the DN1050, the DN860 is able to stretch its sound impressively wide, and passes effects from speaker to speaker with smoothness, precision and natural agility. For example, as Electro fills himself with electricity from the mains power source, you can hear the electrical charge surge past you from either side of the room. As the voices in his head begin to swirl with anger, you hear them whispering all around you, placing you right in the middle of his mindset and fully immersing you in the scene. Sony has done a good job at taking the bright edge off the treble that we noticed in last year’s model, and the DN860 certainly sounds more solid than previous efforts. Gunshots are backed by a decent thud, while the zing of metal buckling and glass smashing as the billboards around Times Square collapse under Electro’s electricity-charged outrage, is clean and clear without any harshness. We think the big, muscular DN1050 has a little more impact in the explosions, but that doesn’t mean the DN860 is lacking. It manages to deliver enough punch to convincingly fill our sizeable listening room, while remaining articulate enough to handle the more delicate elements of a soundtrack. If there’s one oversight here, it’s that Sony has chosen not to put Atmos into the DN860, something many of its competitors will do – even at this price. However, until they arrive into our testing rooms, it’s hard to tell if Atmos is a legitimate addition at this level of receiver, and whether Sony has made the right decision to concentrate on the traditional 7.1ch without compromise. For now, at least, that’s not reason enough to dock it big marks for, but it is something to consider if you’re looking for Atmos. 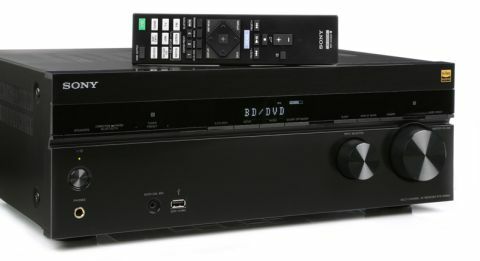 Musical performance from Sony’s AV receivers is among the best available, in part because they are tuned in stereo first, before being tuned for surround. It really shows. Rhythmically the DN860 shows up where a lot of AV receivers fall down, timing well and with precision. It’s a cohesive presentation that does well dynamically, rising and falling in tempo as it should do, and showing off a musical knowhow that we don’t always expect from home cinema amps at this price. We’d certainly recommend putting the amp in Pure Direct mode for the best sound – there’s a touch more clarity in the midrange with it turned on compared to when it’s off – we preferred to keep Pure Direct on with movies during our test too. Bluetooth pairs quickly (even quicker if you have an NFC-compatible device) and allows you to stream music from your tablet or smartphone, with Spotify Connect on board for streaming directly from the service too. This means your device merely acts as a remote for choosing songs, so should it go out of range or be turned off, the receiver is connected directly with Spotify and will continue playing from your playlist independently of your device. The 'DN860 also features Sony's new SongPal Link multi-room functionality, where the amp can work with other compatible Sony devices (such as a soundbar and wireless speaker) to beam music between different rooms. Using Sony's dedicated SongPal app (for Android and Apple) you can group devices together and stream music over wi-fi. If the products in a group support it, Sony's LDAC codec (which claims to be three times more efficient than Bluetooth) is used to transmit audio. For video content from a portable device, Sony has included Miracast, a feature that will mirror the content on your device, pushing it through the receiver and delivering up to a 1080p picture and two-channel stereo sound. Made possible through a direct peer-to-peer connection, it doesn’t even require wi-fi to work. When all is said and done, our first impression of the STR-DN860 remains a lasting one. We knew its undeniable talents would cause problems for its rivals and this test proves exactly that. All this just goes to show that having the latest mods and cons isn’t the be-all and end-all. Ultimately, performance is. And that’s why, after a string of successful entrants in past years, Sony continues to boss the budget market.